Originally a place of public entertainment – the ‘Playing Field’ – this valley was home to the weekly Horse Market. It was the location, too, of Scotland’s first fireworks display, staged by Mary, Queen of Scots, to celebrate the baptism of her son James, in 1566. The bright lights and smoke clearly had a powerful effect on the young prince – when he became King James VI, this is where Stirling’s Witches were burned alive, on his orders. 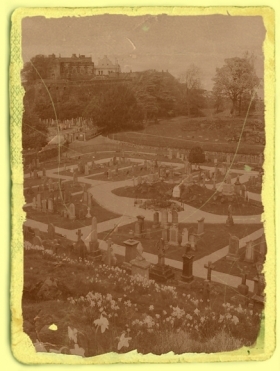 The Baillies of Stirling Council met here, savouring the fresh air, when plague afflicted the Burgh in the 17th-century, and it became a popular weekend haunt for locals, as travelling fairs and touring minstrels took up residence, week after week. The fun and games stopped when the valley was Landscaped by William Drummond, a local Seed Merchant and evangelist, in the 1840s. Statues of important historical Protestant clerics spread out through the Valley and Mar's Wark Cemeteries made the place a classroom of sorts, teaching congregations the origins of their faith.